Marrakech was somewhere I'd wanted to visit for a while. 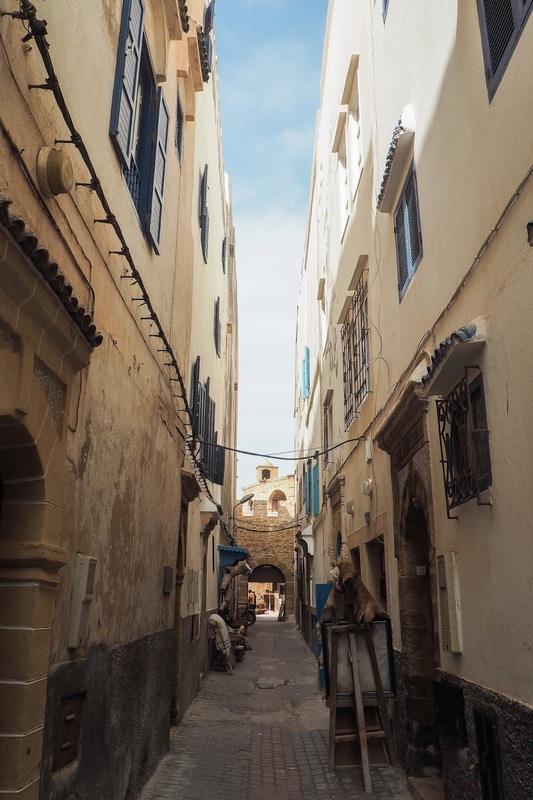 I had dreamt of exploring the souks in the city, adventuring through the winding streets, admiring the beautiful scenery and stuffing myself with Moroccan food. Last year, I finally ticked this gem of a place off my bucket list and let me tell you, it did not disappoint. 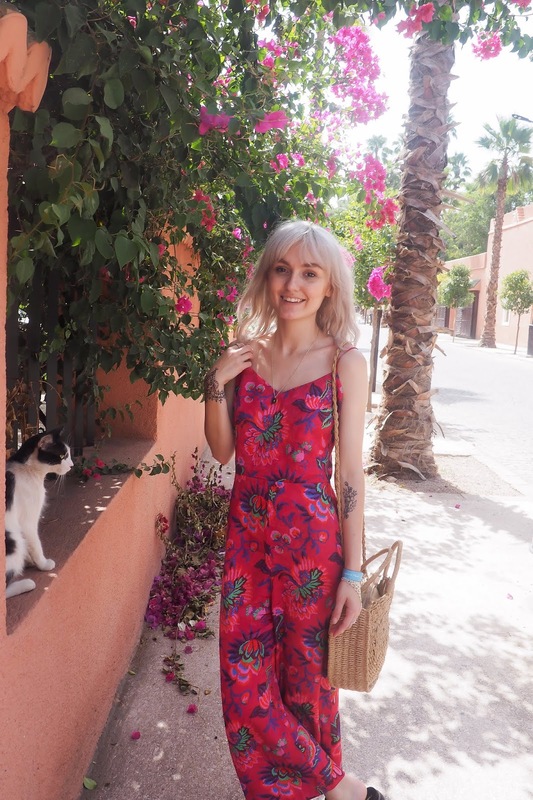 We spent a week in Marrakech and we packed it full of adventures and activities so I thought I'd write a little blog post with my favourite things that we did, along with a few tips and answers to questions I've been asked a lot since visiting. We visited in early September and the weather was exactly how I hoped it would be. It was baking hot, but not as hot as it would have been had we visited in the earlier summer months, like June or July meaning we could go exploring without risking melting into a giant puddle of human on the floor. 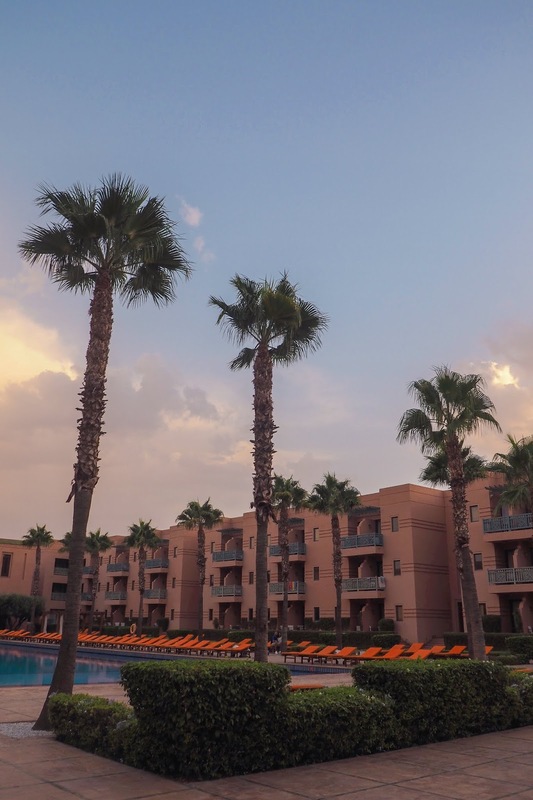 However, there were a couple of days where it rained on and off and one day where there was a huge lightning storm above our hotel, which was incredible to see. 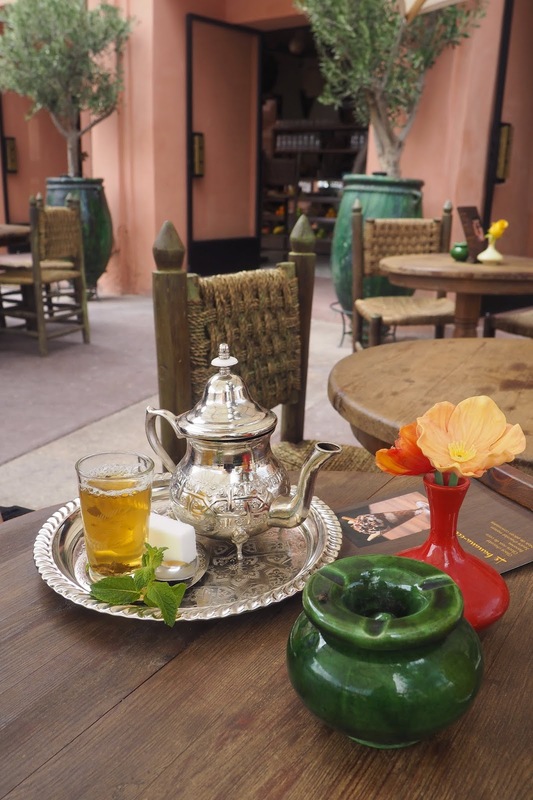 The only thing I would change if I was to visit Marrakech instead is the place that we stayed. Don't get me wrong our hotel was beautiful, with palm trees stretching down the lengths of the pool, amazing all inclusive food and a gorgeous spa that we took full advantage of. However, it definitely didn't have the same wow factor as some of the riads that I've seen. They look absolutely enchanting with a more traditional experience than the huge corporate hotel that we stayed in. 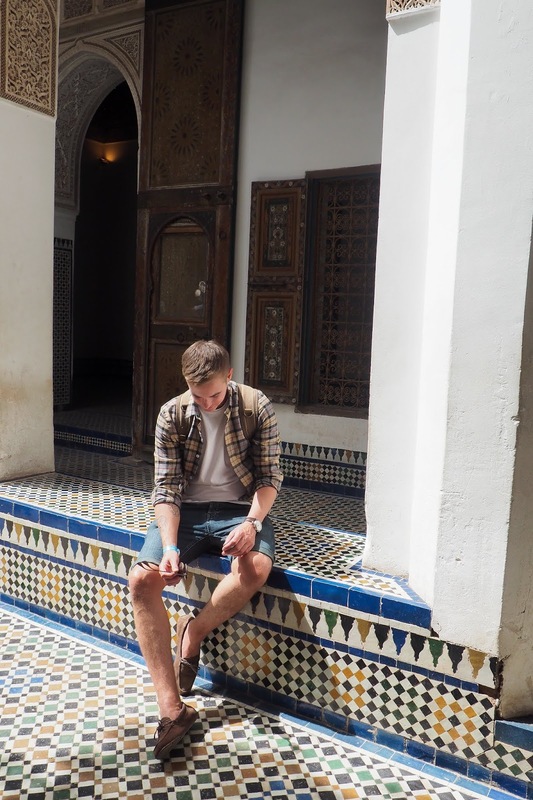 It would also have been lovely to stay in the hustle and bustle of the city centre in one of the riads but staying in our hotel was easy, cheap and had all of the food at our fingertips so it did have a lot of advantages but did just lack that real Moroccan experience. The heart of Marrkech is unlike anywhere I've ever visited before. Once you've found your way through the winding cobbled streets, narrowly avoiding being mowed down by mopeds that appear out of nowhere, you'll find yourself in the main square which is amazing, chaotic, stressful and magical all at the same time. 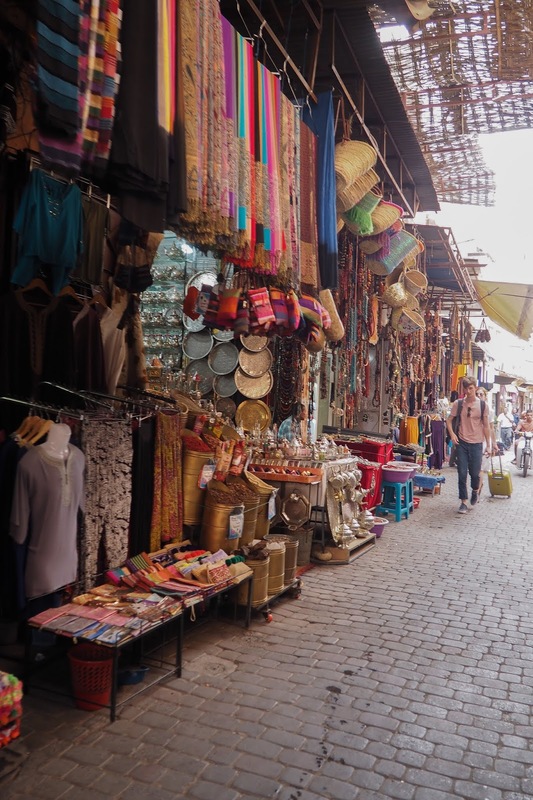 The square is absolutely full of stalls, snake charmers and food stands, little shops selling every kind of spice you could ever think of and souks offering everything from bags to shoes to souvenirs to herbs. 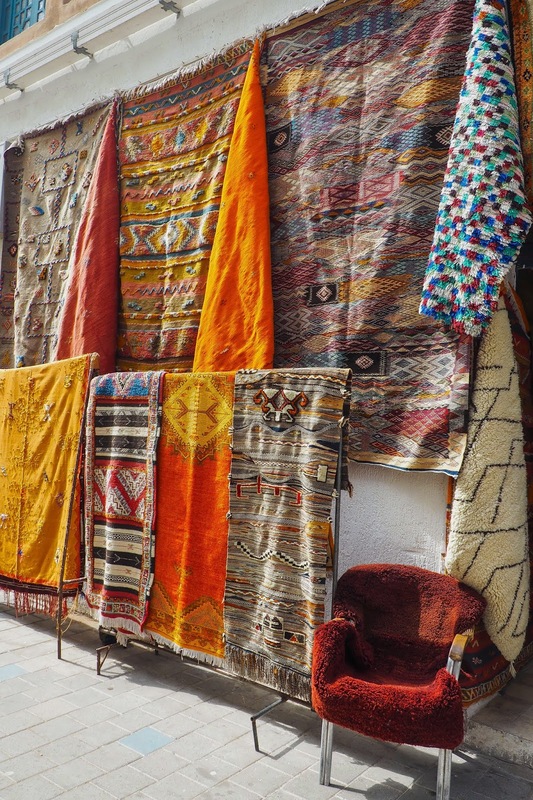 You will find everything in the Souks of Marrkech and the smells, the colours and how much there is going on is almost overwhelming. 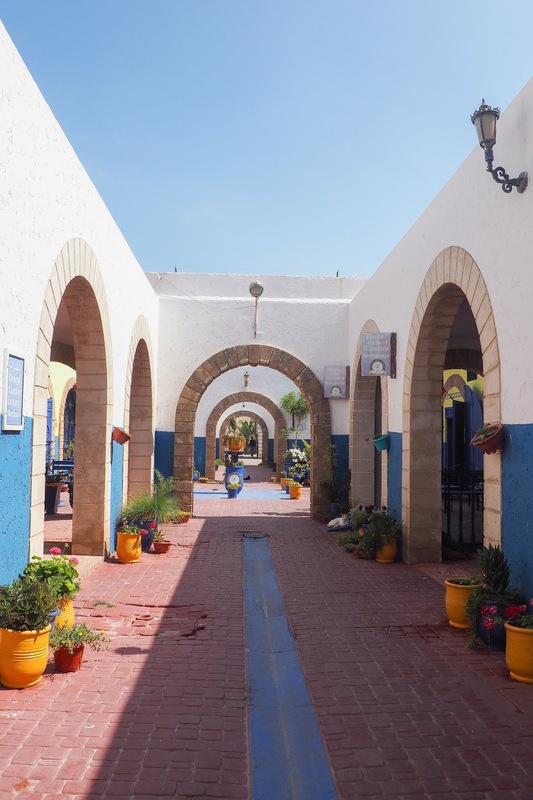 From the main square, there are so many winding little streets that will take you right through the hearts of the Souks an in all honesty, I couldn't tell you which Souks we visited. 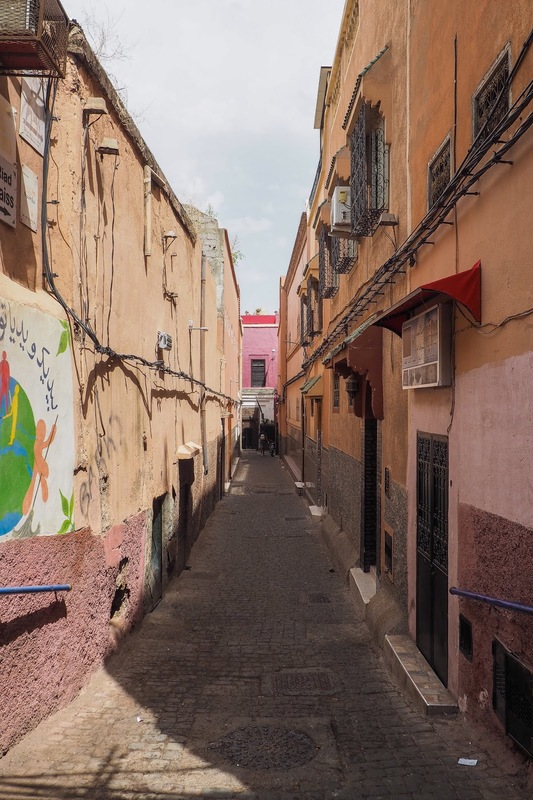 You don't want to get fully fully actually lost in Marrkech (Google maps is absolutely useless here let me tell you) but wandering around the Souks is part of the fun. We bought so many things including a cute little backpack, plates and bowls, cups, little handmade ornaments and an abundance of other small trinkets but I could have literally spent so much more money here. To really appreciate how unique this place is, you have to experience it for yourself. 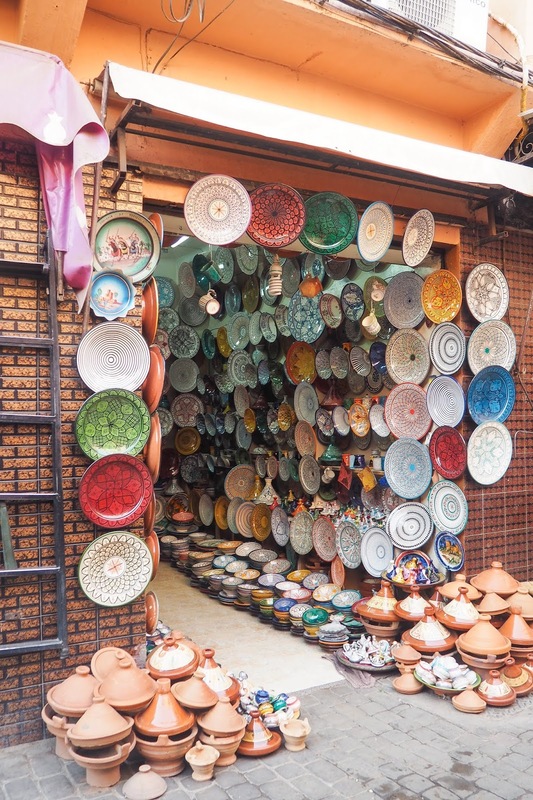 So there are some tips that you probably need to know before visiting the Souks. First of all, you have to barter with the shopkeepers. I think I read somewhere that you should offer a third of the price of what they ask but I don't know how true that is. I tended to offer what I thought the piece I was buying was worth and for the most part, we got some great deals on things without pushing the prices to next to nothing. 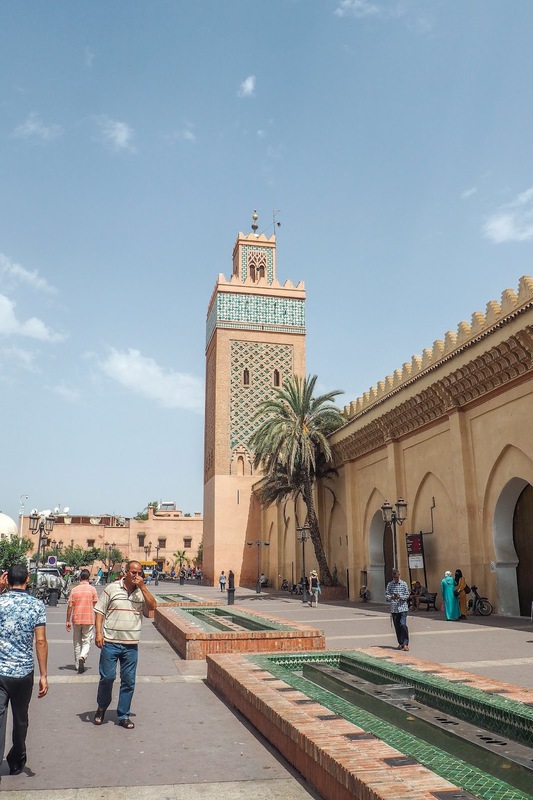 We did get ripped off a couple of times when we didn't really know what we were doing or when we didn't have a full grasp of how much the Moroccan Dirham was in Pounds so you do have to be careful. You will also need to learn to politely say "no thank you" constantly as the shopkeepers can get pushy. This is part of the magic as it adds to the hustle and bustle but if you even look at the stall or make any eye contact, you will find spices and everything else being offered to you. We just learnt to keep walking and politely decline any offers otherwise you get sucked into looking at things you don't really want. 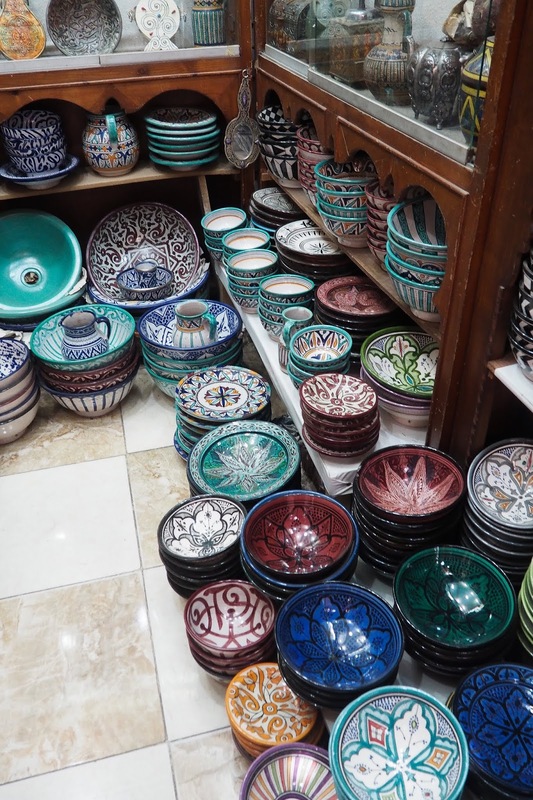 When it comes to taking photos, I found that if you bought something from the souk and asked the shopkeeper for permission to take the photo, they were generally okay. If you didn't ask permission and just go and stand in front of their Souk and start snapping away, they generally will ask you to stop. Basically, just be polite and they will generally be okay for photos! 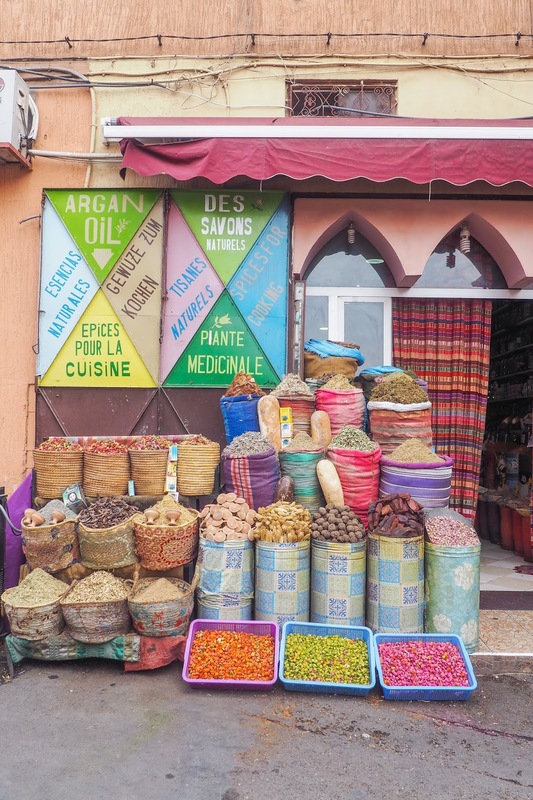 Marrakech might be famous for its incredible souks but it has so much more to offer too. There are some incredible sights to see, museums to visit and places to explore within the centre of the city. 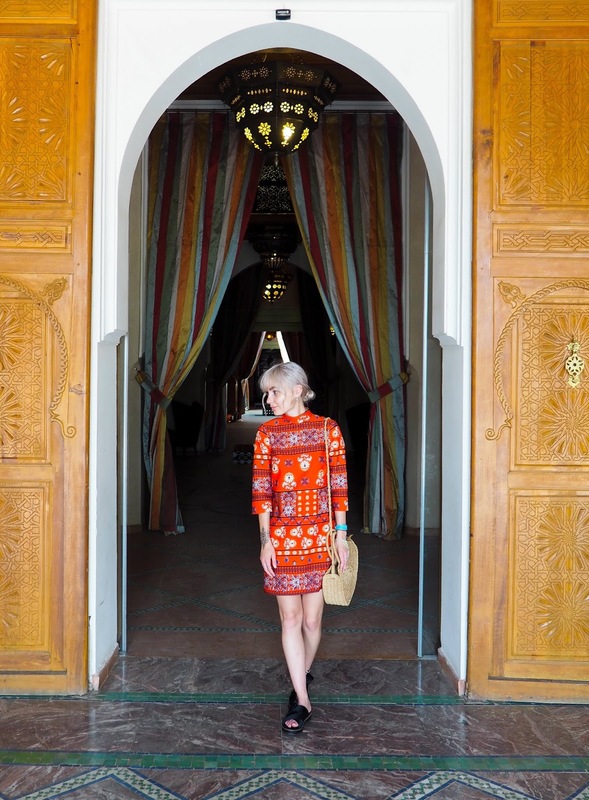 Bahia Palace is an absolute must-see for anyone visiting Marrakech, especially if you're like me and you love bright colours and beautiful architecture. 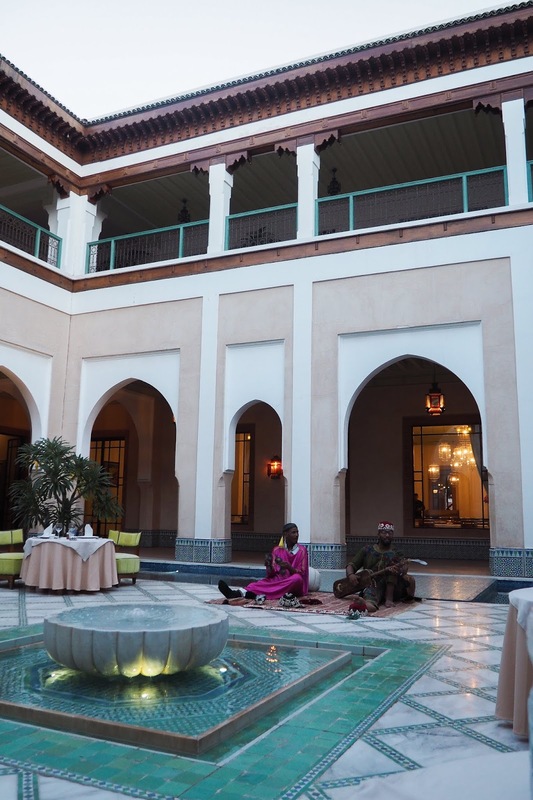 The building is absolutely stunning with white, blue and yellow patterned tiles, high intricate ceilings, extensive gardens and beautiful courtyards. It's a photography heaven with photo opportunities at every corner and I could have probably done an entire post just on my photographs from this place. 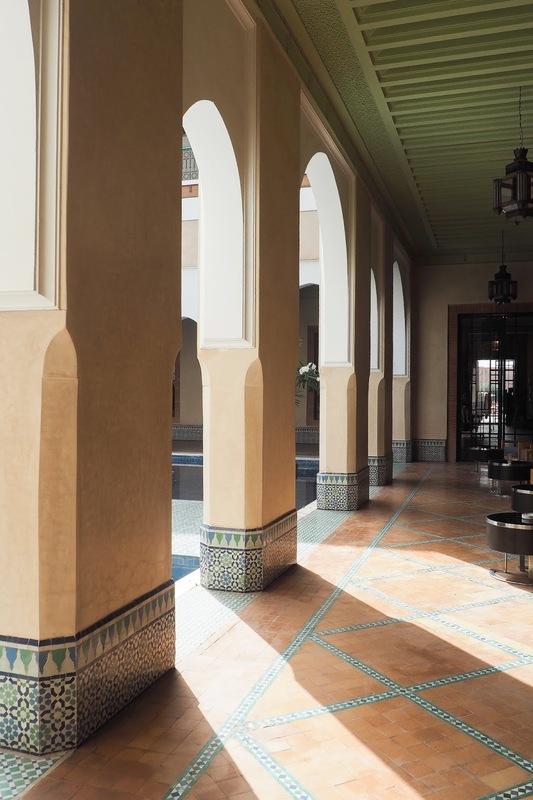 If you follow anyone on Instagram who has been to Marrakech, this is probably the place you've seen on the grid. 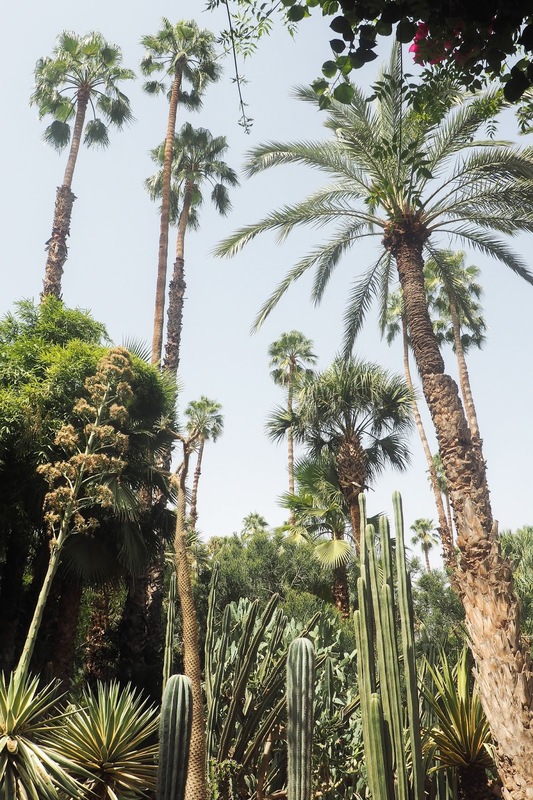 The Majorelle Garden is a beautiful botanical garden meets art gallery, full of cacti, palm trees and water features and of course, the famous blue buildings and architecture. 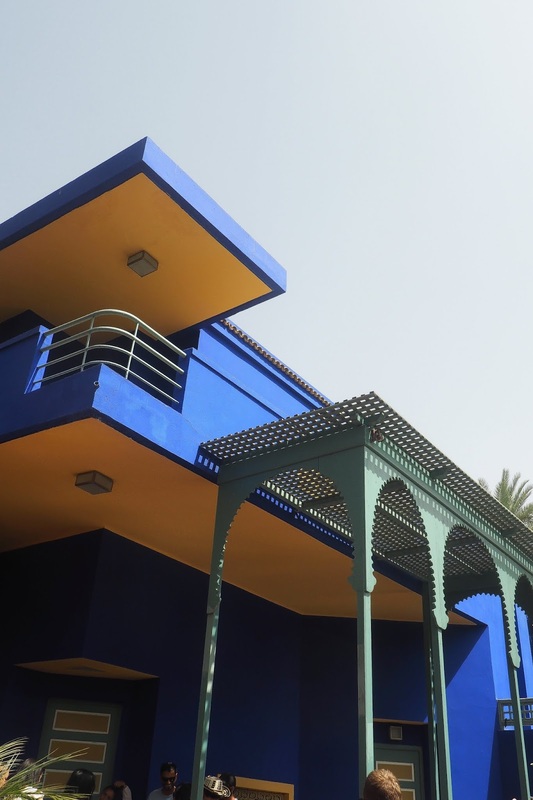 We ate in the Cafe Majorelle and it slightly pricier than other places in Marrakech but 100% worth it, simply for the atmosphere and beauty of it. 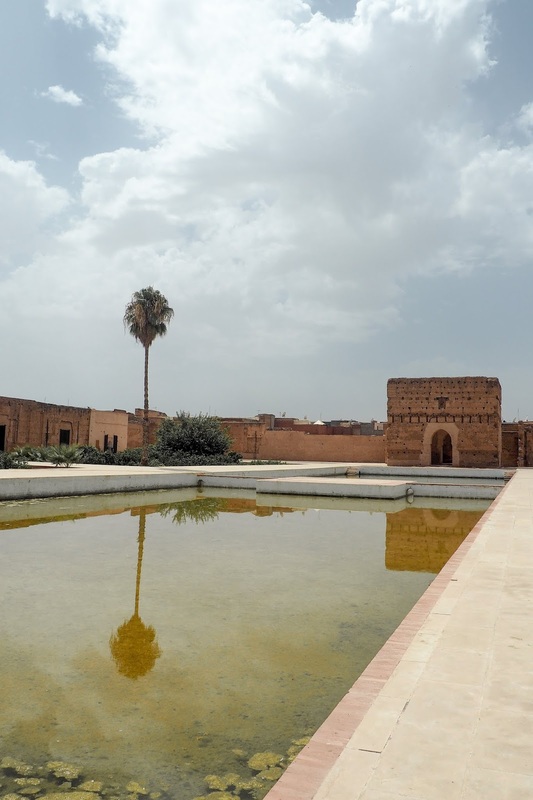 El Badi Palace and Bahia Palace are two completely different settings, but are both incredible in their own right. 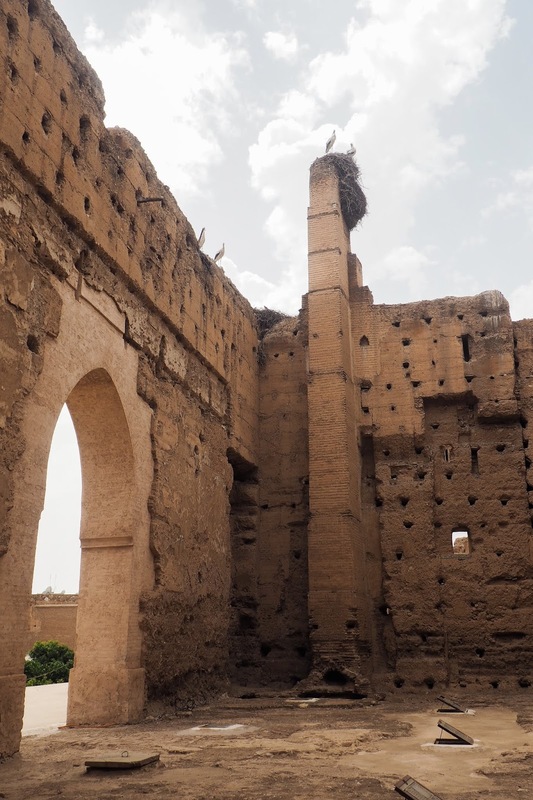 Whereas Bahia Palace is still perfectly preserved and absolutely magnificent with it's decor and architecture, El Badi Palace is more of a historical ruin. That doesn't mean it's any less worth visiting though. It's full of history and it's so easy to wander around and imagine what it used to be like back in it's former glory days. These tombs are super interesting and beautiful. 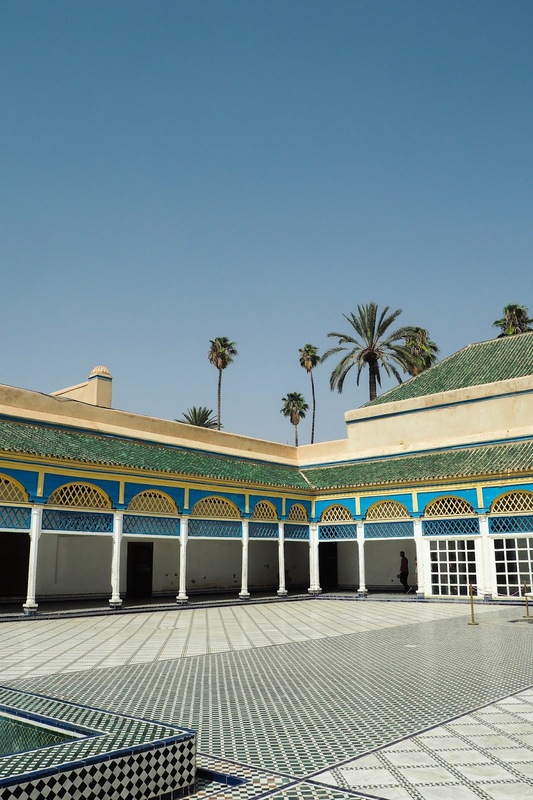 The resting place of the Saadian Dynasty, this area is a must see. 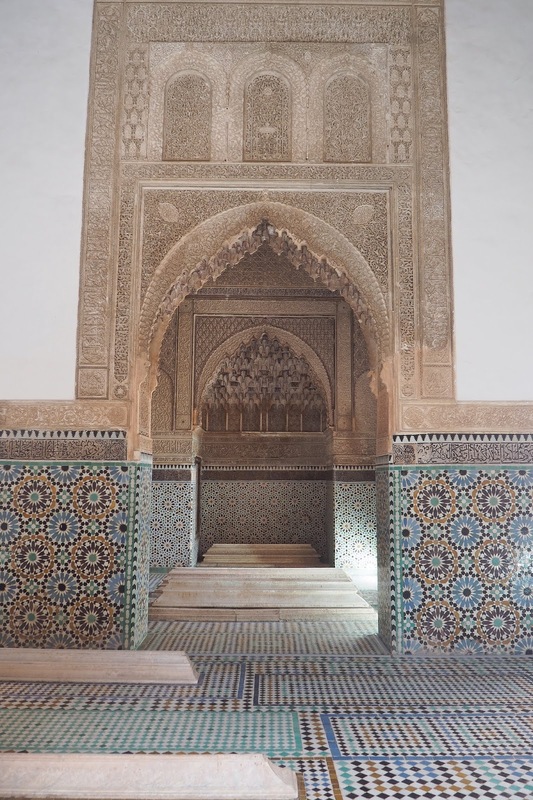 It's quite a small site so won't take you long to see but it's definitely worth visiting with it's beautifully built mausoleums, bright tiles and rich history. 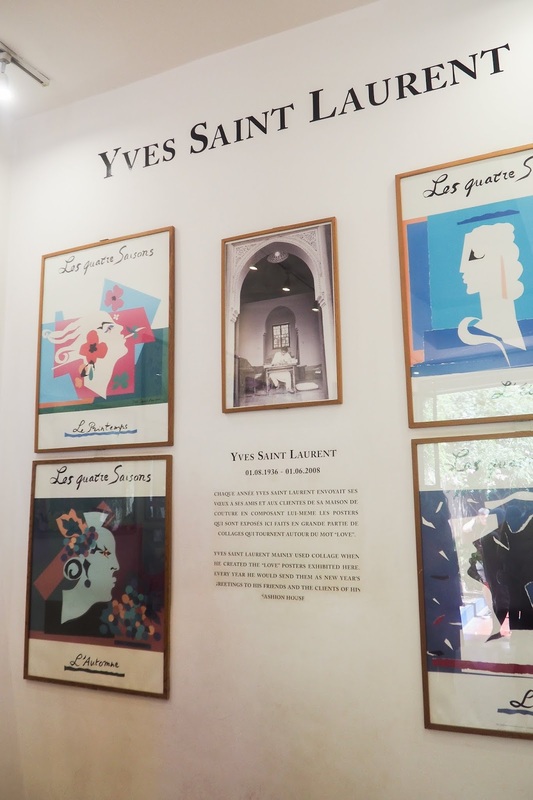 Even if you're not explicitly into fashion, you should still visit the Yves Saint Laurent Museum. There absolutely stunning designs on display, including clothing and accessories, with artwork, sculptures and paintings too. It was fascinating to see and the exhibitions and buildings are so well put together, you need to visit to truly appreciate the elegance of this museum. When I travel, I want all of the adventure and I'm always looking for things to do that are outside the typical tourist attractions. 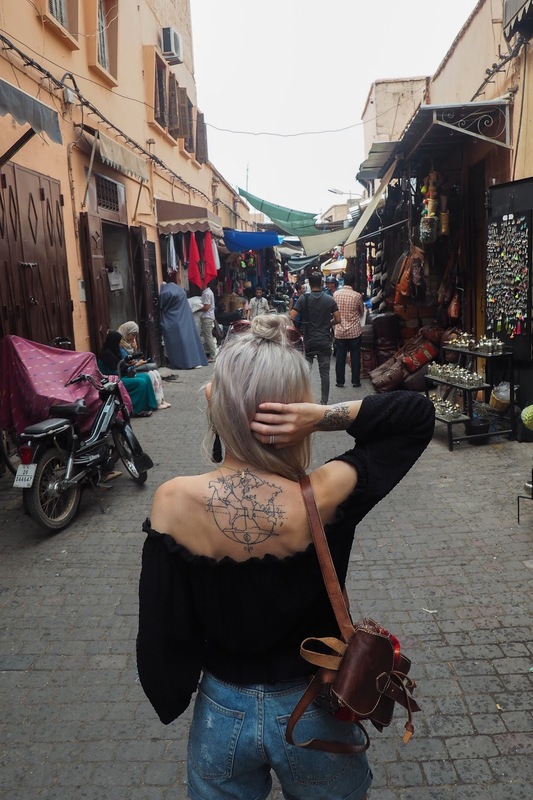 Marrakech is the perfect place for an adventurer as there's so much to do and we didn't even get to everything I would have liked! 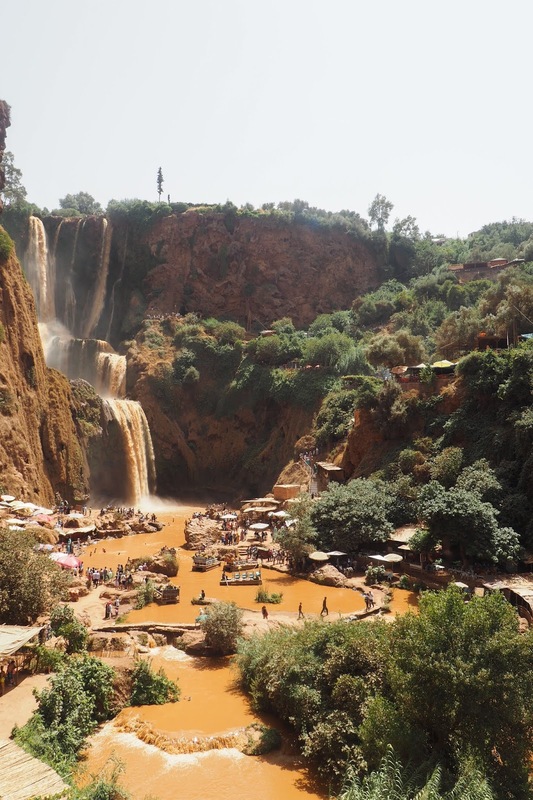 A trip to Morocco wouldn't be complete without a visit to the Atlas Mountains. We booked a tour through TripAdvisor that included transport and a tour guide and the tour was incredible. I know a lot of people don't enjoy tours as much and prefer to go solo but I'm so glad we booked the tour. Our guide was a local who not only took us on the trek through the mountains, but also showed us his home and taught us about Berber culture, showed us how Argan oil is made and gave us all a try of grinding it. 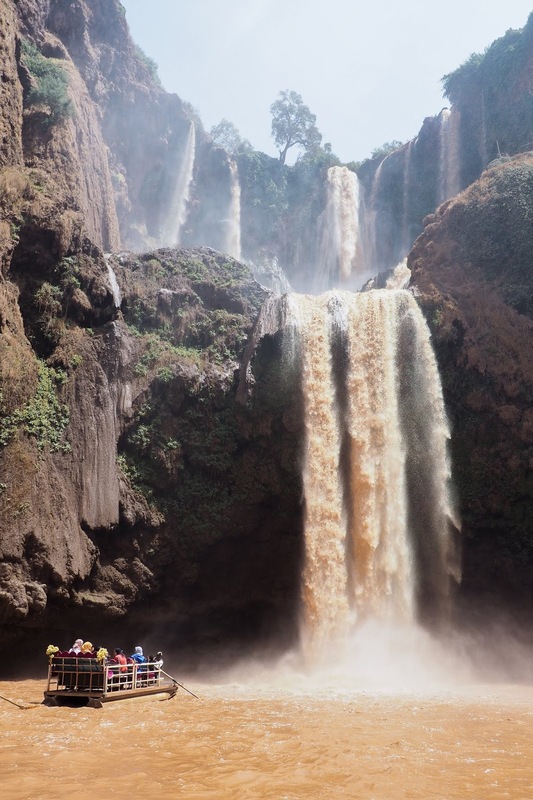 We then climbed down the mountain to the bottom of Ouzoud Falls, the highest waterfall in Africa and this was incredible. 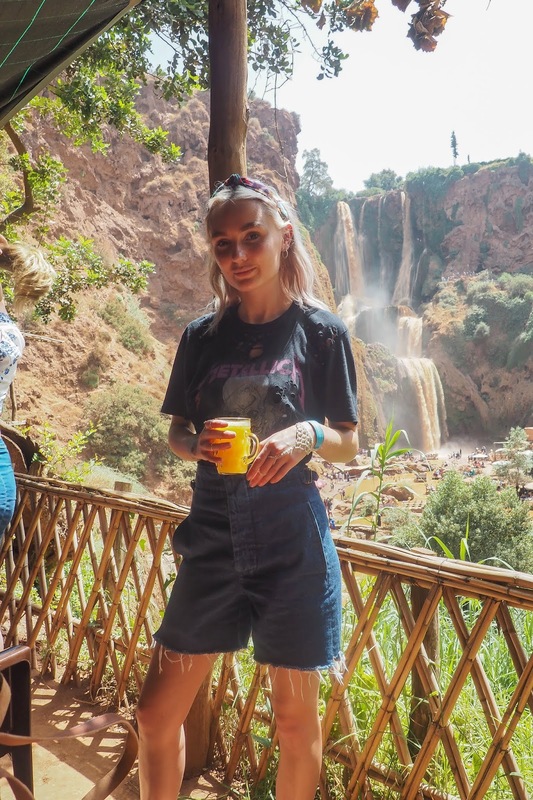 We bought freshly squeezed orange juice at the base of the waterfalls while we admired the scenery then got on a little boat that takes you righttt underneath the waterfalls and it is an incredible experience. You can swim in the water but we sadly didn't get the opportunity to as it had been raining in Marrakech so the water was really dirty. I can only imagine how amazing it would have been to swim! 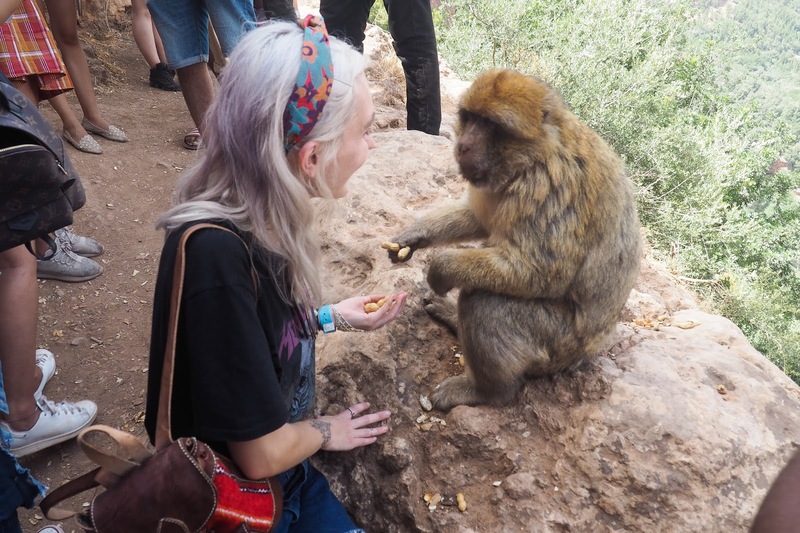 Afterwards, we climbed back up the mountain and stopped to get up close and personal with the Barbary Monkeys. They're quite comfortable with humans as I imagine that they see a lottt of people climbing up and down these paths and you can feed them peanuts too! Be careful though because they are wild animals; one grabbed hold of my backpack and nearly pulled me down the mountain the little devil! This was an excursion that we booked through the hotel. 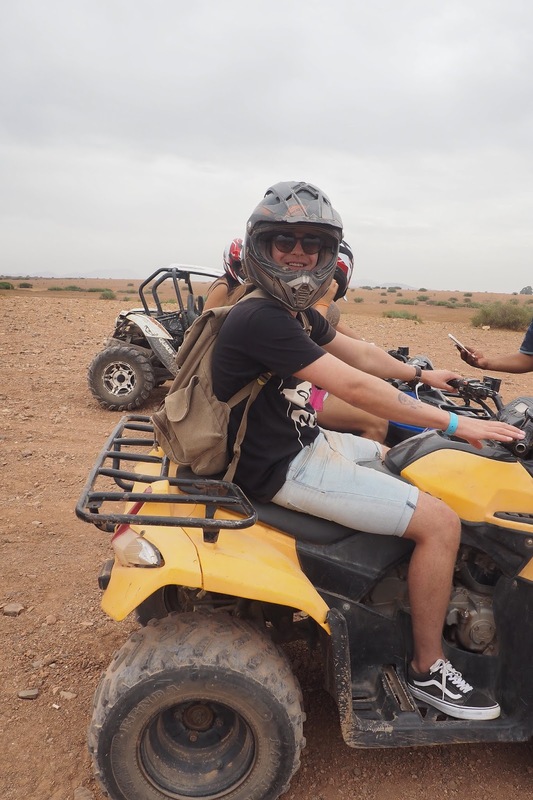 I'd never been quad biking but I'm always up for trying something new and honestly, I had so much fun on this day. 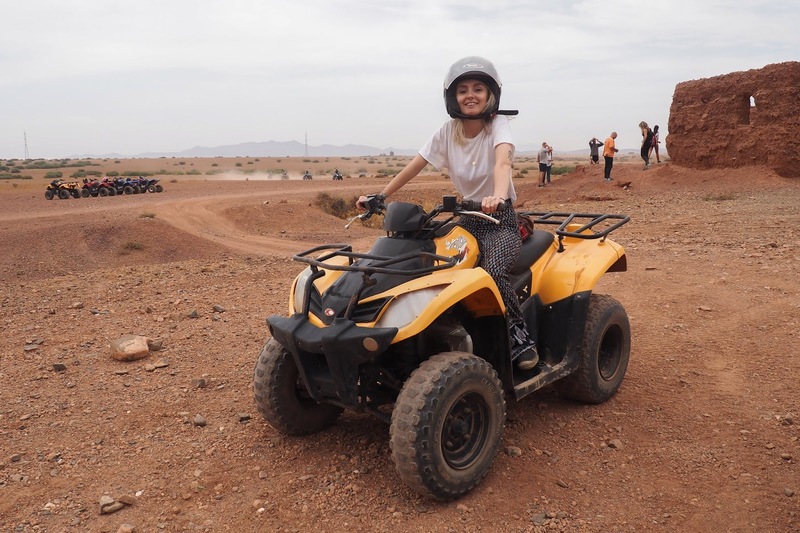 I was a bit nervous about riding my own quad at first but after setting off and getting the hang of steering and accelerating, I got a bit more ballsy and really really enjoyed myself. We drove through some beautiful places in the desert and saw some fabulous scenery, stopping off here and there to enjoy the views. It was such a fun day! 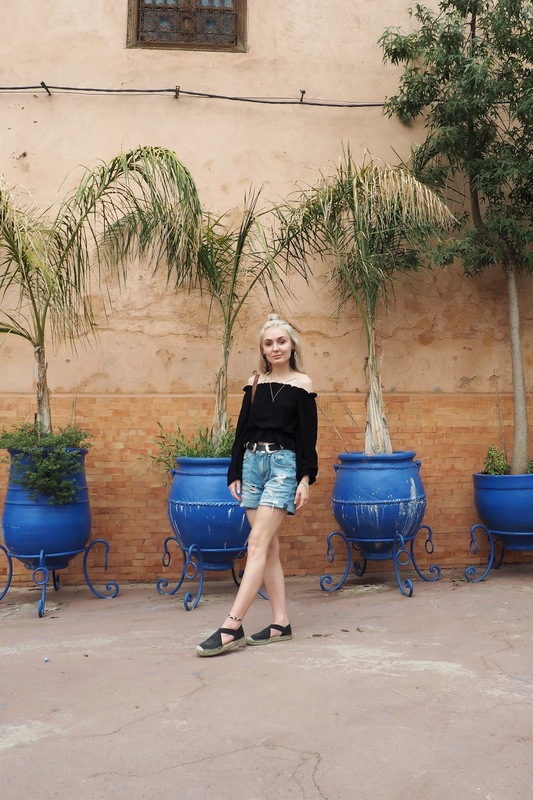 On one of our days in Morocco, we decided to go on an adventure outside of Marrakech and visit the seaside city of Essaouira. 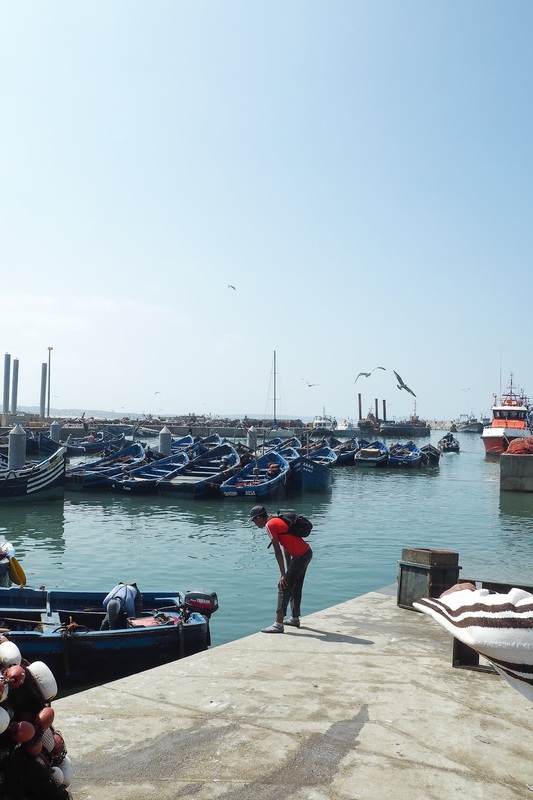 I'll admit, I'd never heard of Essaouira before but after looking into it a little bit pre-trip, I decided I had to visit. I'm a beach gal and although I love the city hustle and bustle, I love getting out to the fresh ocean air and feeling my feet on the sand too. 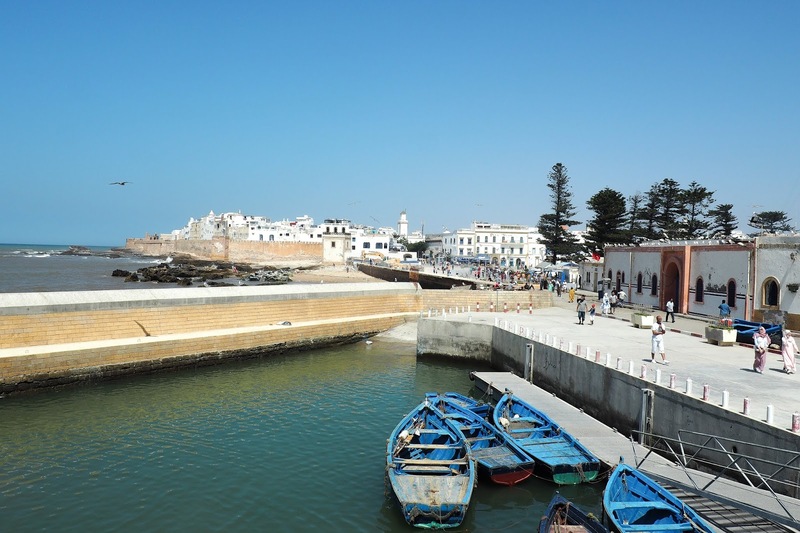 Essaouira is about a 2 hour drive from Marrakech. It's known as "the Windy City" and for good reason too - it was sunny but the wind made it bloody cold! It didn't make it any less beautiful though. 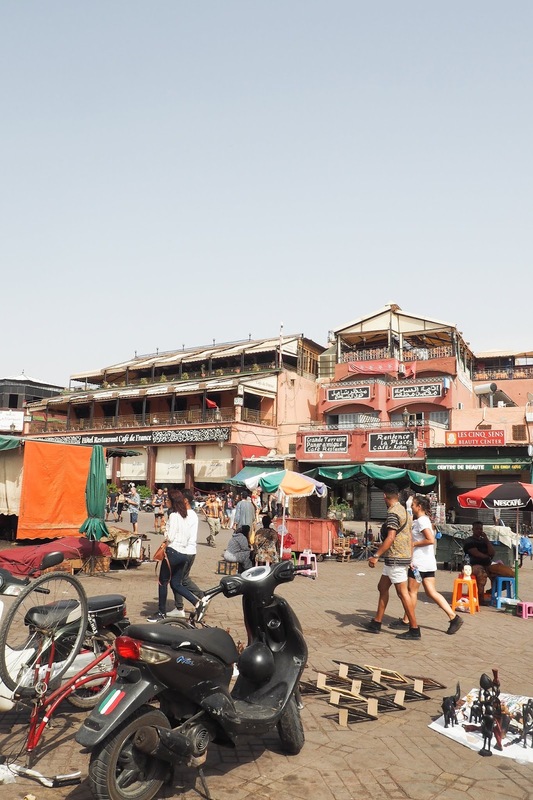 It has a completely different vibe when compared to Marrakech and is so peaceful and serene, with winding streets lined with blue and white buildings, smaller shops and a a beautiful harbour too. The beach is lovely and we sat and ate some lunch on a seaside restaurant where they served their freshly caught fish of the day.. A day here was enough because the city is quite small and there's not loads to do compared to Marrakech but it is truly beautiful and like Marrakech, I've never been anywhere quite like it. 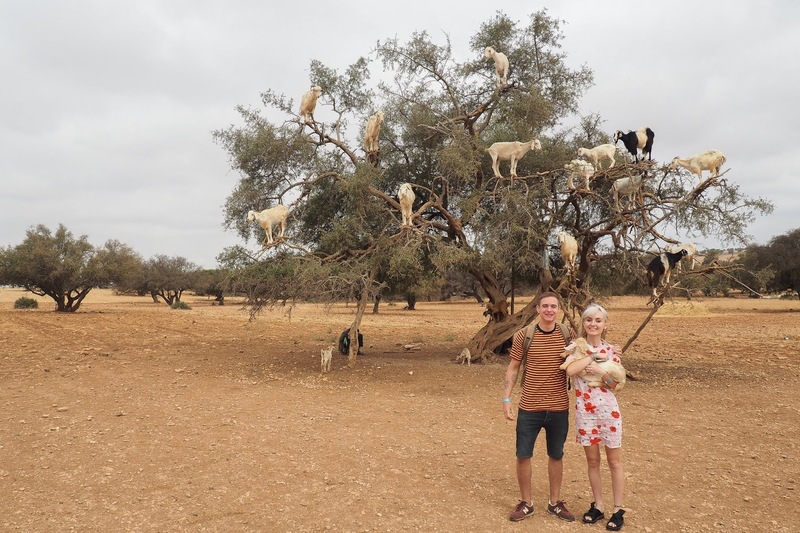 On a random note, we spotted this goat tree on the way to Essaouira and we had to stop and get a lil photo. Those goats were actually in the tree by themselves and the guy who was watching them just handed me the most adorable baby goat for me to hold. It was the best. thing. ever. 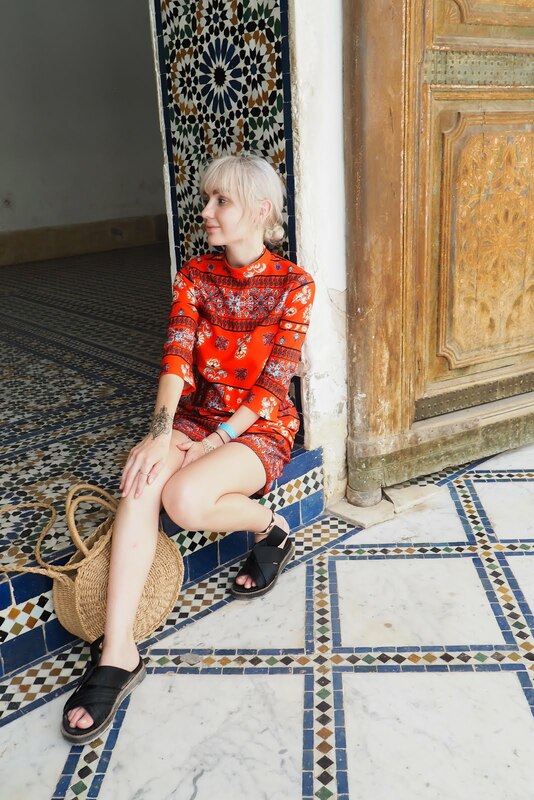 I always see the same questions being asked about Marrakech and Morocco online so I thought I'd give some tips based on my own experience. Obviously I know some people have had very different experiences but this is from my own point of view. 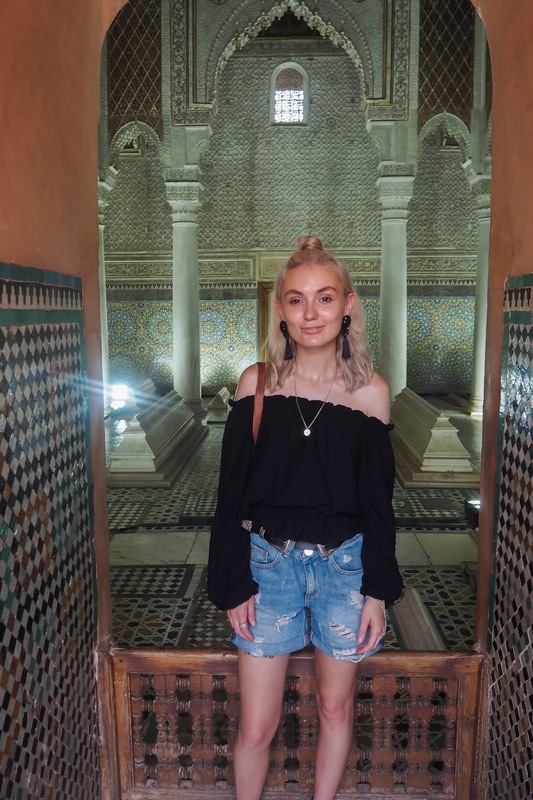 Morocco is a Muslim country and I often see questions about what is appropriate clothing to wear when you're exploring Marrakech. As far as my experience went, the locals were very used to tourists and for the most part, didn't bat an eyelid at people who weren't wearing traditional Muslim dress. However, you do need to be respectful to their culture as it is very different than here in the UK. 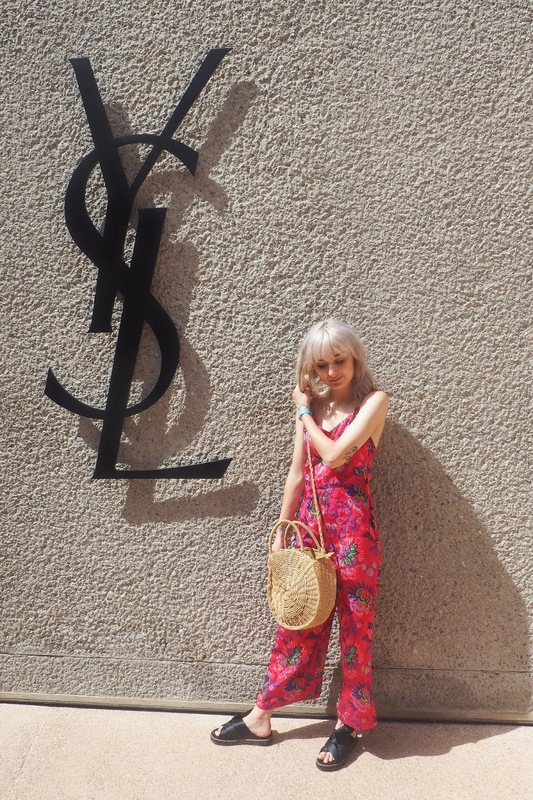 I wore short dresses with long sleeves, strappy jumpsuits and the clothing that you see in all of the photos and had no trouble at all. I feel like hot pants and crop tops are probably not the best idea to wear but as long as you're not showing too much skin and are still respecting their culture, then it should be okay. I have read some different experiences from people though so I think the main thing to remember is be respectful. I think Marrakech gets a bit of a bad rep and people feel like it's unsafe and the people are rude. I didn't find this to be true at all. On all of our excursions, every single Moroccan person we met were hospitable, helpful and kind, particularly the locals we met in the Atlas Mountains. 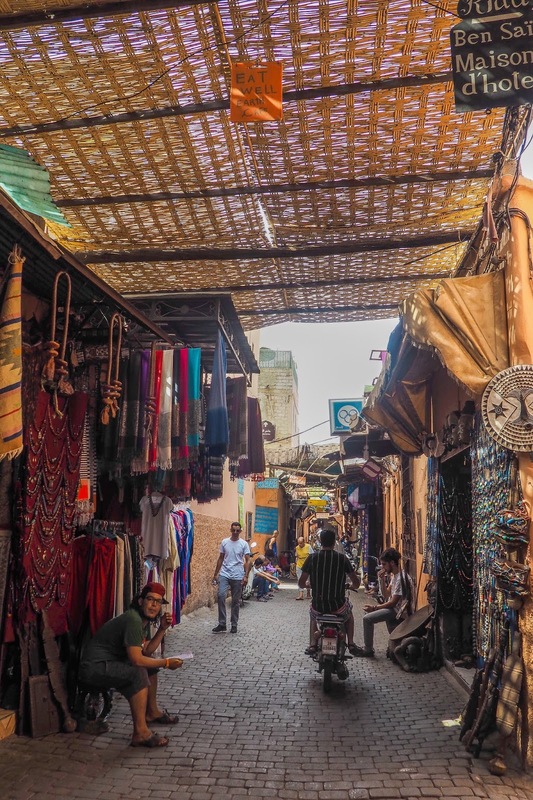 In the Medina of Marrakech, the shopkeepers can get pushy and can be very "in your face" but for the most part, if you polite decline any offers you're not interested in then they don't pursue. We did have a couple of bad experiences that I feel I should include in this for transparency. In one store in the Medina, we were looking at some dupes of designer bags and they were very expensive. We decided not to buy it and the guy got quite aggressive and stood in front of the door to try and stop us from leaving until we bought it and we had to quickly jump around him to get out. We also got lost on the first day in the city and ended up in a very quiet and windy area, where loads of young boys who didn't speak any English kept following us and pointing us in random directions. I'm not sure what their aim was but they seemed to be trying to get us lost and eventually we found our own way out but they followed us for quite a while. Other than that, I never felt unsafe at all and thoroughly enjoyed exploring the city. Nothing is free. If you take photos of anything, expect to have a tap on the shoulder and be expected to pay for it, especially in the centre of the Medina. Finally, I saw a lot of quite upsetting things in the city centre of Marrakech. The levels of animal abuse is not easy to look at. 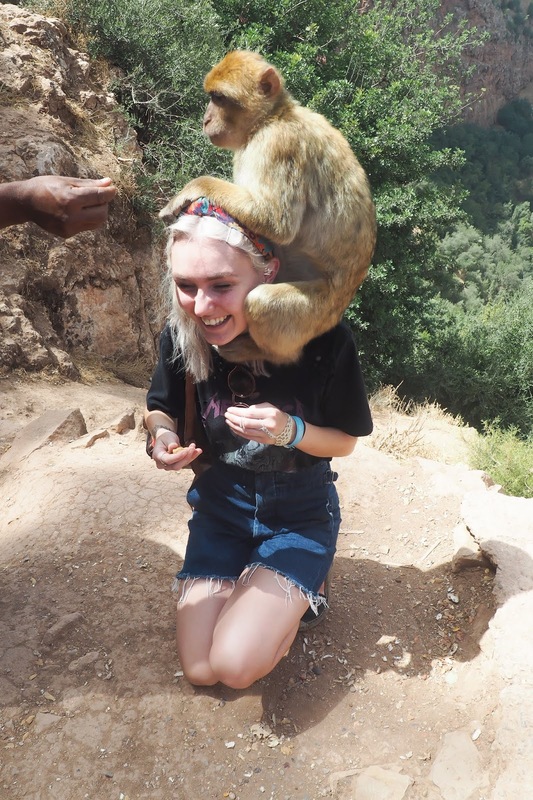 There are monkeys that have been stolen from the mountains that are on chains and in silly outfits for tourists to pose with and they look so, so sad and they are not treated well at all. I found it extremely upsetting and it was very difficult to walk past and see. 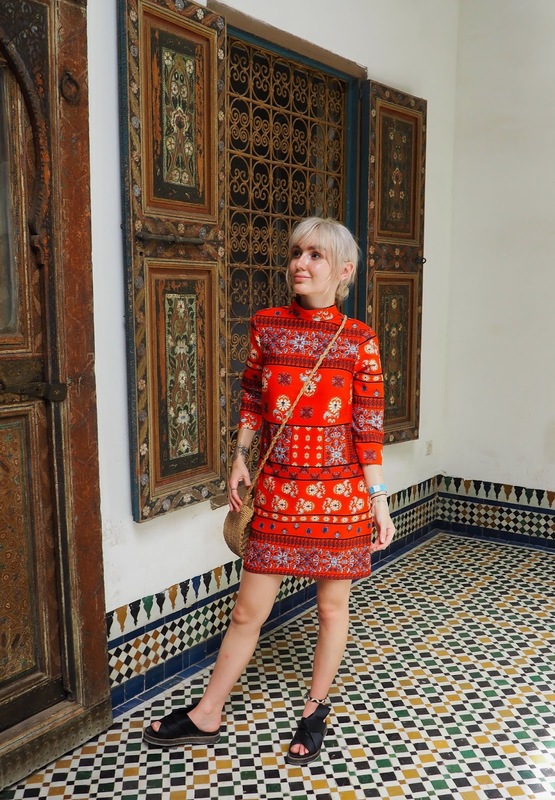 Would you ever visit Marrakech?